Resolution provides an extensive set of templates that build on the power of Excel® and the in-built pricing functions provided by Resolution. These templates add extra functionality to the familiar spreadsheeting environment, and provide you with extended examples. The templates are designed to be friendly and easy to use, yet powerful and flexible. 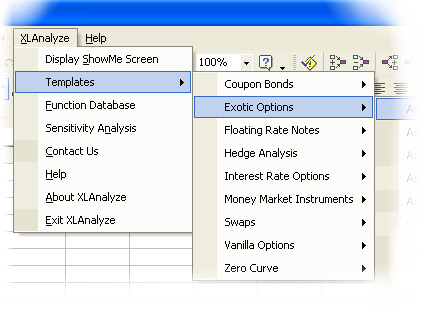 The templates are easily accessible from the Resolution menu in Excel®. Simply look under the 'Templates' menu item to see a categorised list of the available templates. Select one of the items from the menu and a new workbook will be created based upon the selected template. You can even add your own templates to the menu. Save an Excel® template ('.xlt' file) under the 'Templates' directory in the Resolution Software\Resolution folder and it will appear in the Templates menu the next time you start Resolution.